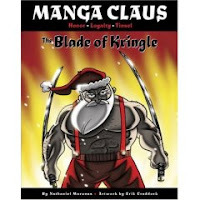 Manga Claus: The Blade of Kringle by Nathaniel Marunas; art by Erik Craddock. Copy from publisher (Razorbill/Penguin Young Readers.) Graphic Novel. The Plot: An elf's plot to get a change in job responsibilities goes horribly wrong, resulting in an attack of evil demon possessed teddy bears who try to take down the North Pole. Only one man can stop them: Manga Claus. The Good: "Honor. Loyalty. Tinsel." And even better: the evil demon possessed teddy bears are evil demon possessed NINJA teddy bears. I know! This book begins with Santa in Japan, receiving a gift of a couple of sword. The backstory is hinted at: our Santa gets around, including hanging out with the samurai in Japan. He looks like the Santa we all know. Meaning in red jacket with the appearance of plumpness. Then it's the present, and that darn Elf stirs up trouble. See, he thinks that if he brings a Ninja Nutcracker to life and then comes in to save the day, Santa will love him best. (Hey, it's the worst movie ever, but Fritz should have watched Endless Love to realize that this never ends well.) When Fritz does this, he gives the time honored Bwa hah hah of evil. Followed by a coughing fit. Cheetah, age six, asked upon seeing the cover, "is this a book where Santa is evil?" Nope, I answered. Tho I agree with her that he looks evil. No, Cheetah, it's not evil Santa; but rather, once Santa gets his swords and prepares to fight, he becomes buff hot bod Manga Santa who is ready to take those demon possessed Ninja teddy bears down. It's like a horror movie; except Santa is the action hero. I just wish I had read this & posted it timely. Like, not in February. A Year of Reading review. This book looks way fun! Thanks for the review! Wasn't this a scream?!? It makes me smile just remembering how Santy bursts out of his red suit all buff and ready to do serious damage to the evil teddy bears! This was my fifth graders' favorite holiday book. Hands down. I just read Manga Claus, based on your comments about it at Midwinter, and completely agree that it's a great, funny book. I see it for boys in the same age group as the girls who are reading Babymouse.